Have you discovered that our library subscribes to SimplyMap, an Internet-based mapping application that enables users to develop interactive thematic maps and reports using thousands of demographic, business, and marketing data variables? This tool is incredibly valuable for market research in both Canada and the United States. 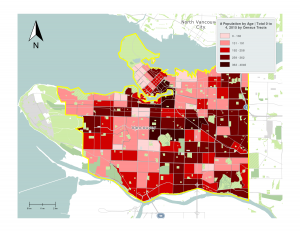 It allows you to generate both maps and tables displaying demographic (census related) or spending patterns data for one or more specific geographic location such as cities, towns, municipalities, and neighbourhoods. It also allows you to plot on a map the location of businesses operating in a specific industry in a selected geographic location within Canada and the USA. Tables and lists generated can be exported to Excel and maps can be incorporated into power point presentations and other file formats. SimplyMap is very user friendly and has a Map Wizard which walks users through the steps of creating a map. Maps can be created almost instantaneously after selecting the desired variables. It also offers a range of editing functions that allow you to control how datasets are displayed in the map after you have created it. GIS experience is not necessary to use this product but we encourage you to consult the Census dictionary to become familiar with census geography terms (census tracts, census subdivisions, etc.). You can also watch a brief introductory video for SimplyMap. Have we piqued your interest? If so, we recommend you get in touch with a business librarian. Be sure to drop in during our reference hours, Monday to Friday 1-4 at the David Lam Library. We would love to illustrate the amazing benefits of using this interactive tool.